Shell Flower -- Ghost Dancer's black and white pinto bff -- is back in the "special mares" pen at Palomino Valley wild horse center. She'd been in the hospital pen for about a week and a half, before the vet and wranglers determined she wasn't sick and probably wasn't suffering from kicking injuries. Though Shell Flower has swollen joints, she appears healthy & at ease with the other horses. I didn't see her getting picked on and she held her own at feeding. I talked with manager John Neill at some length about her & he says there will be a vet's note on her Internet photo indicating she shouldn't take heavy riding. All the more reason for her to go to a sanctuary. I hope to adopt both Ghost Dancer & Shell Flower and free them in a sanctuary. One of them has a small population of mountain lions, which has taken down and eaten foals. When I told John Neill, he said he was confident Shell Flower could defend herself. So that's good. Ghost Dancer is still friendly with her, even after her absence, even though Dancer has another friend, a BIG dark brown mare with a bald face and a freckled streak on a hind leg (enough that BLM lists her as pinto). The three amigas have worked out the two's-company-three's-a-crowd bit & sandwich Ghost Dancer between them as they eat. Today I returned to the Palomino Valley wild horse holding corrals. Approximately 80 "special" Calico Mountain horses have been taken from the Fallon facility to Palomino Valley. Unlike my last trip there, the Calico horses have the place almost to themselves. According to manager John Neill, most of the other horses have been taken to Broken Arrow in Fallon to make room for MORE WILD HORSES which will be rounded up this summer. Shell Flower is back in the "special mares" pen with Ghost Dancer and her bald-faced, white-streaked back leg buddy. They are all alert and interested in what's going on around them, though they only flick their ears when the heavily pregnant burros bray. According to BLM, updates on the Indian Lakes facility in Fallon, where many of the Calico horses are still confined, will be posted every Friday. Please let me know as soon as you see anything. Sorry I've been so random about my blog posts. All that is about to change and I really am going to teach myself to Twitter as lots of you have suggested. I just spent a great four days signing books at the Reno Rodeo. It was wonderful to talk with so many people from around the country. Millionaire ropers stopped by to chat and so did ranch kids who pointed out the difference between bulls and steers to a bystander. I saw more kids roping each other than ever before and I thought about my Jake roping Sam and Ace when he was being stubborn in the river. I talked examined an amazing pink rhinestone-encrusted breast collar a teenager had saved all year to buy for her sorrel mare and thought of Sam and Jen shopping at the rodeo booths in Mountain Mare. Although I have qualms about traditional rodeo sports because of the effects on the animals, I was lucky enough to be signing at a table overlooking the cutting horse arena and I thought about Ace some more -- this time the real Ace -- who took me on some pretty exciting cutting bursts bringing wandering cows back into the herd on the cattle drive that inspired it all. p.s. Guess why I posted the cute critter at the top of this entry? Three more stallions have died at the hands of BLM. Those of you who know horses are aware that gelding is a common and routine procedure. 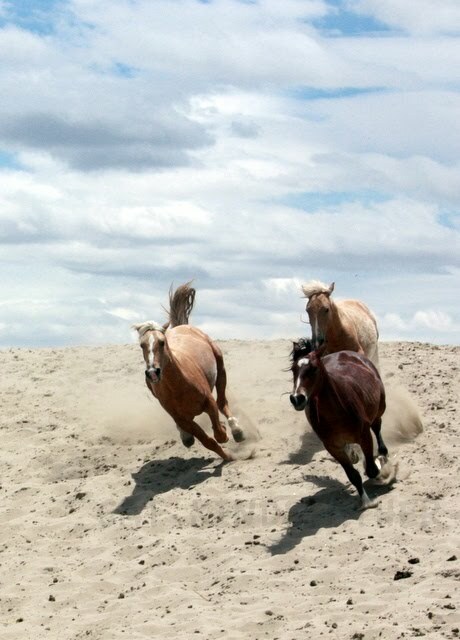 There is no reason that three wild stallions should have died during that procedure. 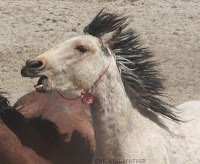 Not only are the bloodlines of the Calico Mountains horses vanishing, but the horses are being tortured in the process. HUMANS HAVE A CHOICE. WHAT THEY DO WITH EACH CHOICE TELLS THE WORLD WHO THEY ARE AND WHAT THEY VALUE. Come see us at the Ro-day-OH! 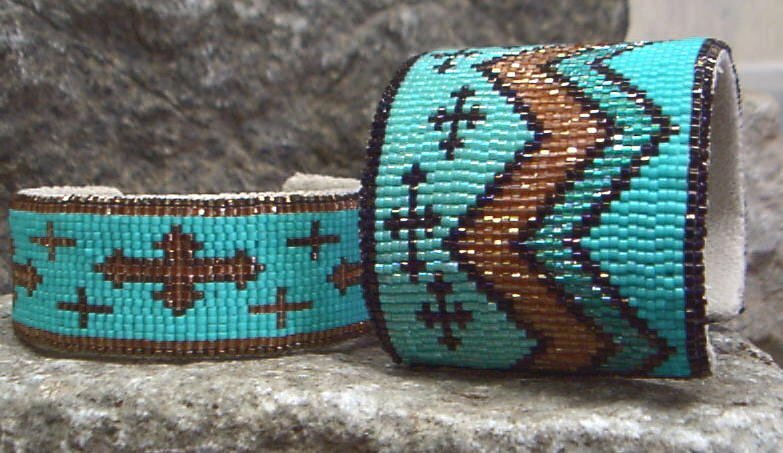 Kathleen Brannon, owner and designer of Desert Sage bead art will be there, too! Ever since I set a "Google alert" on WILD HORSE ISLAND so that I could read what people were saying about my second series (and Darby and Hoku), I've been getting news about Wild Horse Island in Montana. Today I got this beautiful photo. Such tranquil beauty, I had to share. I just came from the Federal Courthouse in Reno. I've written a brief account of what happened, below. Davis and Keathley admit to using public lands as their private shooting gallery, and to gathering their spent shells. These are adult men who knew it was illegal to kill America's wild horses on public lands, but they didn't care. Tod Davis and Joshua Keathley represented by Tom Plimpton (retained) and John Springgate (CJA) respectively, faced AUSA Sue Fahimi in Federal court before Judge McQuaid to change their pleas from not guilty to guilty and waived a trial in the case of shooting 5 free-roaming horses on public lands. "We was out early in North Washoe and seen them wild horses and killed a few of 'em and then we left," said Keathley when asked to describe the morning the shootings took place. Davis gave a similar account of the events, adding that the two had been drinking and looking for a place to set traps when they spotted a band of eight mustangs. "We used poor judgment and shot a few of them." Davis said. Davis and Keathley will remain free on bail, with their firearms in the custody of a county sheriff, until sentencing Sept. 14, 2010, 2 pm. The maximum sentence for this charge of maliciously causing the death and abetting the death and harassment of five wild horses is one year in county jail, $100,000, $25 special fee. There is no possibility of parole. Sue Fahimi, U.S. attorney, gave a fuller description of the November events, indicated that the two stopped driving when they saw a herd of horses. Keathley, armed with a AR 15 shot first. "A light-colored horse went down," Fahimi said, and then Keathley handed the rifle to Davis. "Davis began shooting at the others"
Five horses lay dying while Keathley picked up 8-10 spent ammunition casings. Best-selling author and wild horse activist Terri Farley will share the skills and passion characteristic of her 36 best-selling books free of charge in WRITING THE WEST workshops at the Western States Horse Expo in Sacramento, California, June 11 – 13. 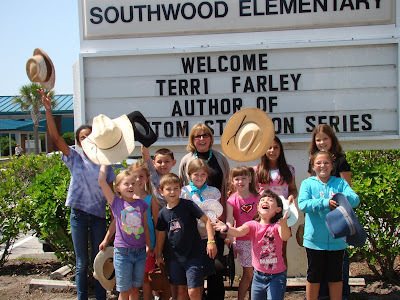 Farley’s workshops explain how she uses hands-on research experiences from driving cattle and riding in a Pony Express reenactment to job-shadowing Hawaiian paniolos and following the West's wild horses to color her Phantom Stallion and Wild Horse Island series. Workshops for adults and children will be featured. Farley is especially excited about WRITING THE WEST for kids, which introduces young authors to writing outside the classroom. In nationwide workshops, Farley teaches adults to write memoirs, blogs, poetry and saleable stories. "If you don't tell your story, who will?" Farley asks, "If not now, when?" The Calico Mountain mustangs recently rounded-up by the Bureau of Land Management are the same herds featured in Farley’s Phantom Stallion series. “I’m not let them going without a fight, and neither are my readers,” Farley says of the West’s wild horses. When the Wild Horse and Burro Advisory Board refused to read even one among hundreds of protesting letters from her young readers, Farley became a plaintiff in a federal lawsuit to save the herd. Farley will autograph her books in the Young Rider Park and Book Corral, after each presentation. A discount coupon is available on Farley’s website at PhantomStallion.com. Please keep the Indian Lakes wild horse facility on Broken Arrow Ranch open for public visitation at least two hours each week. This facility has had its share of problems, but citizen vigilance alerted BLM staff to problems which might otherwise have resulted in the deaths of more captive wild horses. The decision to lock out the public is "explained" in a BLM press release by the fact that Indian Lakes is a privately-owned and operated facility that was never intended as a public facility and isn’t staffed to serve the public. If it was never intended to be a public facility, why not? Americans have a right to view the care of horses deemed theirs by law. As for staffing, during my many visits to Indian Lakes I was never guided by more than one BLM staffer until a recently-arrived PR person was added to a late May tour. If BLM has a five year lease on this private property, two hours a weeks is a paltry bit of time, but I’ll settle for it. The press release indicates weekly facility web site updates will be published. I welcome that, but not in place of visits. There may be other gaps in business-as-usual like the one which does not keep track of foals born in the facility. The same press release claims the Calico Mountains horses have “successfully transitioned” to their new environment. BLM's own numbers say over a hundred (including premature foals) have died at Indian Lakes and dozens remain in hospital pens. Wild horses are tough. 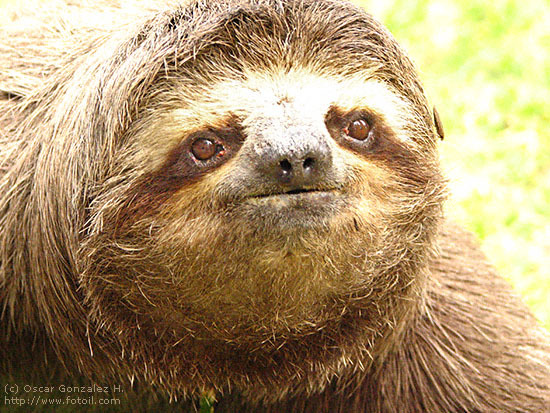 They take care of themselves in the wild, but they cannot when not in fenced they are drugged, castrated and captive. They have not regained the health they had on the range. To say they have contradicts what visitors have seen with their own eyes. Secrecy breeds suspicion and, in this case, death. Please reconsider the decision to hide America's wild horses. I'm going out to see Ghost Dancer and Shell Flower today. They're no longer at the Fallon facility, but at Palomino Valley, the BLM facility on which I based Willow Springs in my PHANTOM STALLION books. These girls need to go back out on the range and I'll be talking to anyone who'll listen to learn how I can make that happen. Of course all of the Calico horses should return to their homelands, and it seems paltry to just set my sights on two. Even in captivity, youthful strength and energy is beautiful. Photographer Cathy Kindsfather caught these young stallions at play during the next to the last visit BLM will allow at the Indian Lakes facility at Fallon. After Thursday, the public is no longer welcome. I had a wonderful time at this Orlando school!